1972 saw the birth of the ILF (Infant Liberation Front), a terrorist organisation for the under-10s. The anarchic underground group was slow to make an impact because many of its younger members had not yet developed the literacy skills required to understand the group's manifesto. 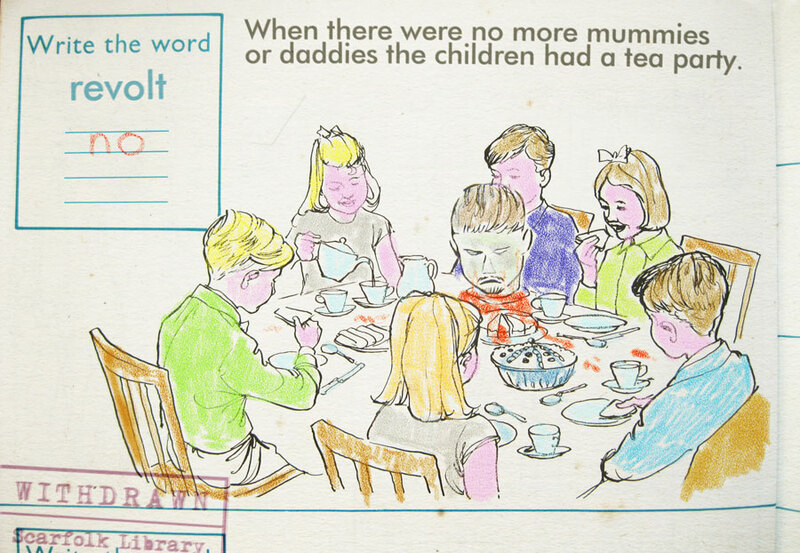 The breakthrough came in 1973 when the ILF published a more accessible colouring book. 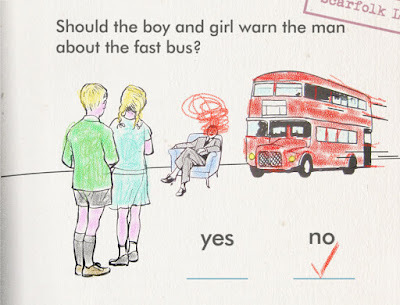 It outlined the group's aims and depicted recommended acts of terror which could be easily carried out before bedtime. The book was an instant hit and widely distributed in school playgrounds. The ILF's goal was to create a paedocracy, but not only; it also wanted "the freedom to eradicate all grownups (without having to get their permission first)". To this end the group would go to any lengths. Hordes of children roamed the streets (after they had completed their homework) hunting stray adults, and in 1976 alone 250 grownups disappeared or met their fates. In 1978 the ILF disbanded when Arthur Grubbe, a 50 year old investigative journalist, infiltrated the group by posing as a 3 year old girl. Grubbe revealed that the ILF was secretly funded by local government who intended to groom sociopaths for positions in the civil service once they reached the age of majority. Grubbe became something of a celebrity and Arthur was the most popular baby girl name of 1979. Below, an ILF leaflet. 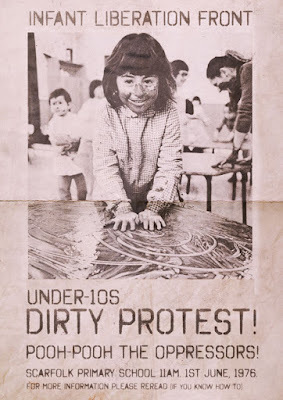 ILF members regularly held dirty protests, especially those under the age of one. They doggedly maintained around-the-clock demonstrations which were only interrupted by feeding time and naps. You can learn more about infant civil disobedience HERE and HERE and HERE. 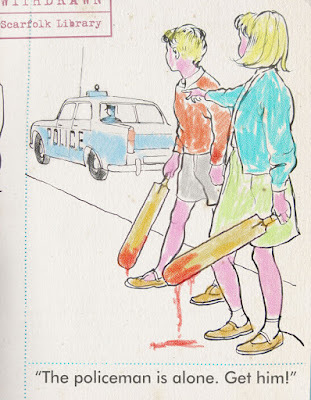 A classic colouring book from my childhood. My favourite was the 'Using Guerrilla Tactics to Ambush and Secure the Ice Cream Van' page. Or "The Use of Repetitive Teletubbies Viewings as Brainwashing." This is my first visit to Scarfolk so clearly I'm somewhat overwhelmed - reminds me of the creepy black and white village in Quatermass II which took me 33 years to finally track down, but that's another story. Did the ILF take its inspiration from Shuji Terayama's Emperor Tomato Ketchup film(s)? Which according to a biography I just read about him, actually began as a radio play by him in a fake-documentary War of the Worlds style broadcast - it was called Otona-gari (Adult-Hunting) and was broadcast on Japanese radio in 1960 - unsurprisingly, it was a huge scandal with people getting fired etc. 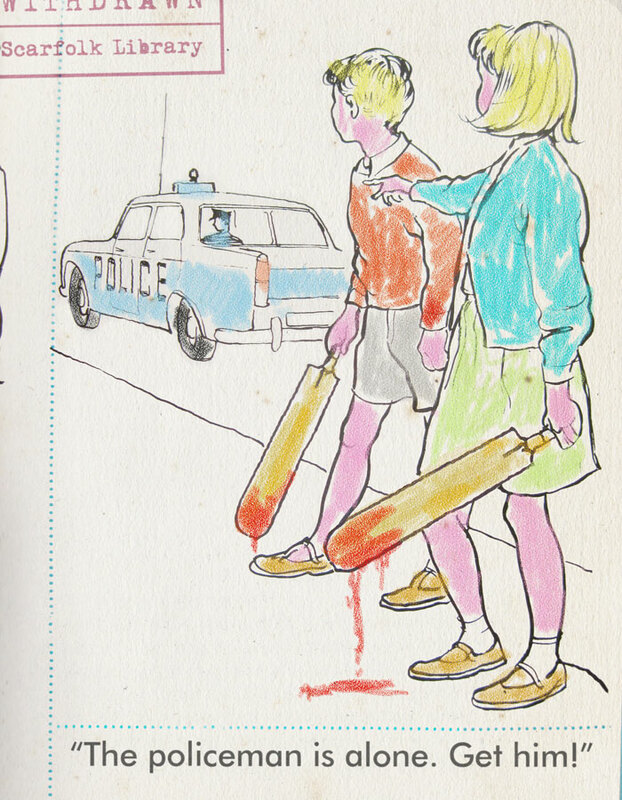 Loved the 'policeman is alone, get him' colouring sheet - I once did a similar poster with a Ladybird style graphic of a Dixon of Dock Green style copper bending down to a little girl who is looking up at him with the caption "did you kill my daddy?" 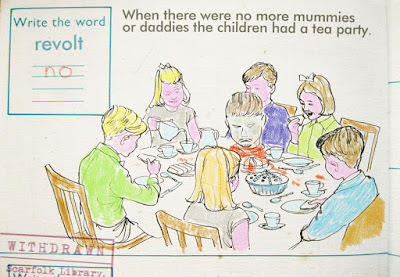 (which as much as I would like to take credit for, there was a stamp produced in the 70s with a similar scene and Situationist types would scrawl variations of the daddy kill theme over their envelope. 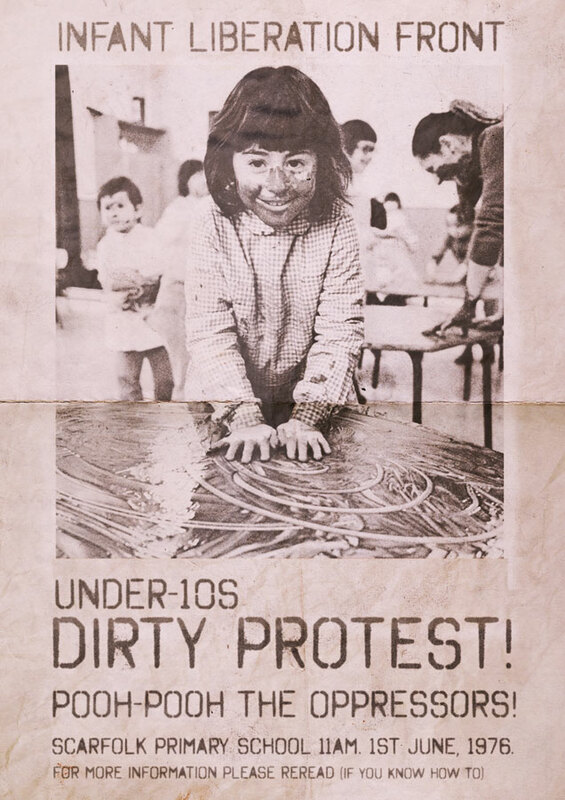 Also loved the Pooh Pooh the Oppressors poster - its been a while since I saw the font made out of the plastic alphabet sheet, beloved of late 70s and early 80s anarcho-punk zines and posters. Now, how do I get out of here? Out of here?Oh dearie,why would you ever want to leave?When this is your home now!Just take you happy medicine,and lie down so the nice people can watch you sleep..